We recently interviewed Nina Simon, director of the Santa Cruz Museum of Art and History (MAH) and learned about the museum’s new teen program. This week, we are excited to introduce this program on the Incluseum! Our guest blogger, Emily Hope Dobkin, current Youth Programs Manager at the MAH, will share the process through which the program came to be as well as its vision and current iteration. It is not everyday your museum director inquires on your ultimate dreams and passions, and a few weeks later, gives you the reigns to make it happen. When I was brought onto the MAH team back in the 2012, I was able to express my strong desire to work creatively with teens on a regular basis–to do something in the realm of arts for social change, and to help give them a voice in the community. In time, it became clear that as a museum, we felt a strong need to work more closely with an important and often neglected segment of our population (teenagers) to make the MAH a more relevant and compelling place for everyone. During the next few months, I took the time to learn about what was/is currently being offered to teenagers to not only pin point how our potential teen program could really offer something that did not already exist, but also find ways to eventually collaborate with these various groups. During this time, I become much more aware of some incredible organizations that have completely inspired us, including FoodWhat? !, The Teen Center, Grind out Hunger, The Boys & Girls Club, Girls for a Change, Project reGeneration, The Watsonville Youth City Council, and later the Santa Cruz Youth City Council. What I came to learn is that there was not a program focused explicitly on community leadership, specifically through creative and artistic experiences, but a strong support for creating one. From there, I began to create the structure for Subjects to Change (S2C), a program geared to put teenagers in the driver’s seat and give them real responsibility and leadership opportunities in a creatively formatted, supportive environment at the MAH; a program that would focus on exploring what it means to be an active community member, how as community members, teenagers can create change, and the tools necessary to ignite leadership. We have achieved these three goals by engaging teenagers in various capacities during 2013. In our initial co-creation process, we hosted a Teen focused C3 (C3 stands for Creative Community Committee and invites people to cross-pollinate and share ideas…the most promising of which we follow up on to plan new programs) meeting that introduced teenagers to the envisioned program, specifically asking them to provide feedback and brainstorm further the direction of the program that fully launched this Fall. 43 teens from across Santa Cruz county attended, and together, we learned what exactly community means and consists of for local teenagers, as well as the parts of the community that matter most. We targeted issues that concern teenagers on a daily basis from bullying, to homelessness, to littering to matters surrounding sexism. From there, a Teen Advisory Board was formed, consisting of 7 teenagers who continued to give feedback on a bi-weekly basis during the Spring 2013 and helped plan our Fall 2013 launch. This Fall, Subjects to Change launched with 15 teen participants representing eight schools from across Santa Cruz County. Subjects to Change-ers meet at the MAH every Thursday afternoon to talk about community, create art, and change–for themselves, their group, and the community. Meetings include team-building exercises, occasional guest speakers, and offsite documentary work in Santa Cruz to help identify key issues in the community at large. The group identifies themselves as “a group of chronic doodlers who dig music, embrace creativity of all kinds, and are determined to not only make our community better, but want to get other teens involved.” Through discussions and ventures out into the community, teens have explored community needs and assets as well as issues that surface for them on a daily basis. Teen participants share what they have made and discovered thus far with Subjects to Change. Photo Credit: MAH. 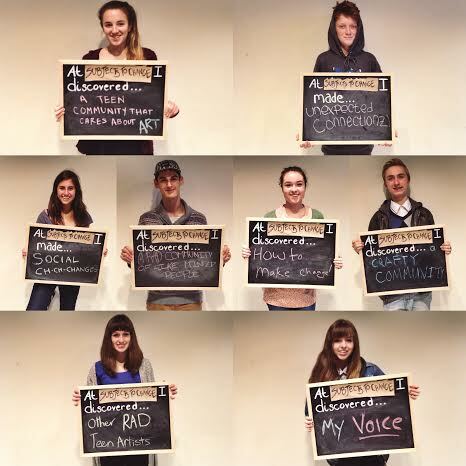 In the spring of 2014, teens participating in Subjects to Change will design a project that raises awareness about one or several of these issues through a specific art project. Starting in February 2014, Subjects to Change participants plan on hosting teen nights at he Museum as way to provide a cool, hip, safe space for teens to gather on a Friday night…but not just to congregate and mingle. They want to share and show other teens what’s going on here in our community, and what it means to be part of a community. They want to empower other teens to help make changes here by raising awareness about particular issues, including homelessness, public safety, and gender stereotyping. They have already begun to find ways to collaborate with various community members and local Teen groups to make these events happen. Most recently, they met with the Santa Cruz Youth City Council, and together, plan to build a community art project at the Santa Cruz Levee that will bring even more teens together in the process. Subjects to Change has given me the power turn my ideas into realities – making a difference in the community doesn’t seem impossible anymore. I finally know how to look at setbacks in cultures, and disturb the cycle effectively in order to make positive change. I would like to make a positive change in my community and I feel this program is helping me do that. It is so inspiring to see people my age care about our community and want to make a difference. There is such value found in teenagers from different parts of the same community getting together to share ideas, passions, and beliefs. To watch teenagers empower one another in itself is one of the most compelling aspects I have found working with Subjects to Change. 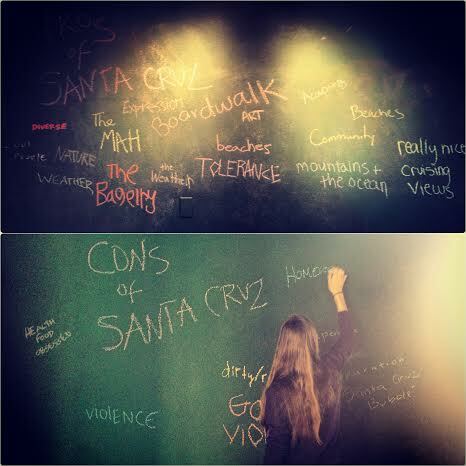 The Writings on the Walls: Subjects to Change-ers began their change-making process by first noting pros and cons they find in Santa Cruz. Photo Credit: MAH. It’s been exciting to see Santa Cruz teenagers flourish not only individually, but together, while becoming vital assets to our community and contributing to the overall health of society. Their ideas, goals, and passions are already making a difference here within the walls of our museum, and anticipate with time, will also break down some invisible walls that have been built up here in the community. ← Incluseum featured on Museum Minute’s “Meet a Museum Blogger”!